I mean Eataly, but it definitely felt like we were in the beautiful country when Becca and I decided to check out this market and restaurant downtown on Friday. The atmosphere of Eataly is completely captivating – you can easily smell the freshness instantly and your eyes dart from place to place as you try to take in all that is going on around you. A friendly employee sits at a customer service desk with a map of the whole place, which is greatly appreciated seeing as the two stories seem to have an endless amount of handy products and delicious food. The first floor consists of a colorful grocery market, kitchen accessories, and the dessert counters, including Gelato and Nutella – yummm. Upstairs guests can find different restaurants set up by sections that offer a variety of Italian dishes to appease the palette – Il Pesce, La Pizza, La Pasta, Le Verdue..the list goes on. Hundreds of wine bottles, additional beverages, and kitchen ingredients await customers among aisles. Becca and I quickly realized this whole shebang was much more fancier and wonderful than we ever expected! We put our name down for a nice table at La Pasta and made our way to La Piazza, a bar where small dishes are served, to wait. 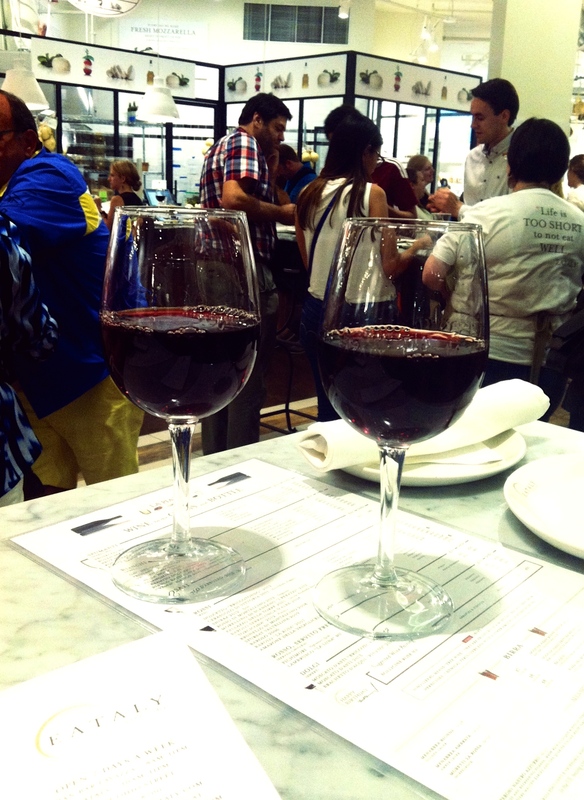 We felt so sophisticated as we chatted over a glass of Morellino di Scansano, a red wine from Tuscany. I have never been one to really drink red wine, but this one was divine and has made me open to branching out for sure. We finally sat down, enjoyed some fresh bread, and struggled to decide on which dishes to feast on. 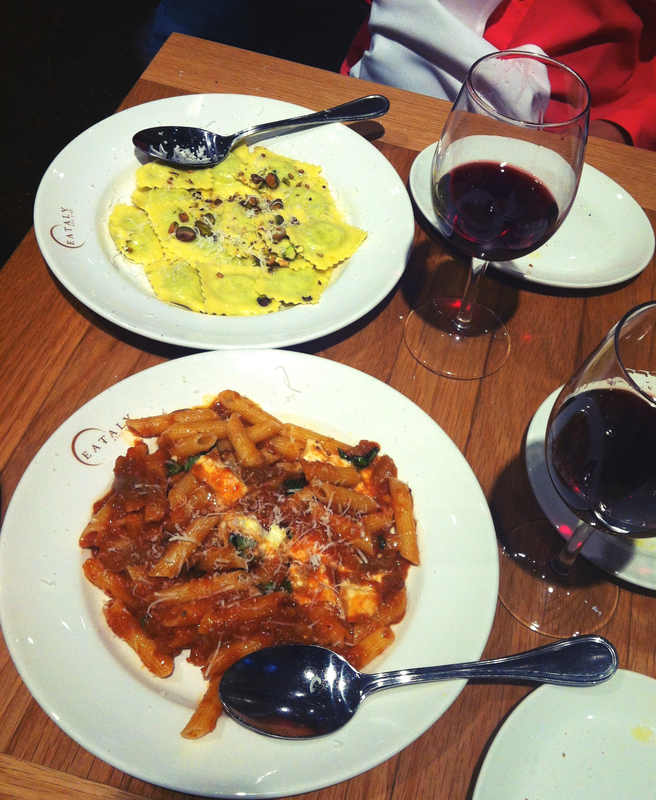 All the mouth watering options made it quite the task, but in the end we chose to share the Penne Rigate, a penne pasta with eggplant and mozzerella, and the Quadrati, a ravioli dish with spinach and Ricotta cheese. 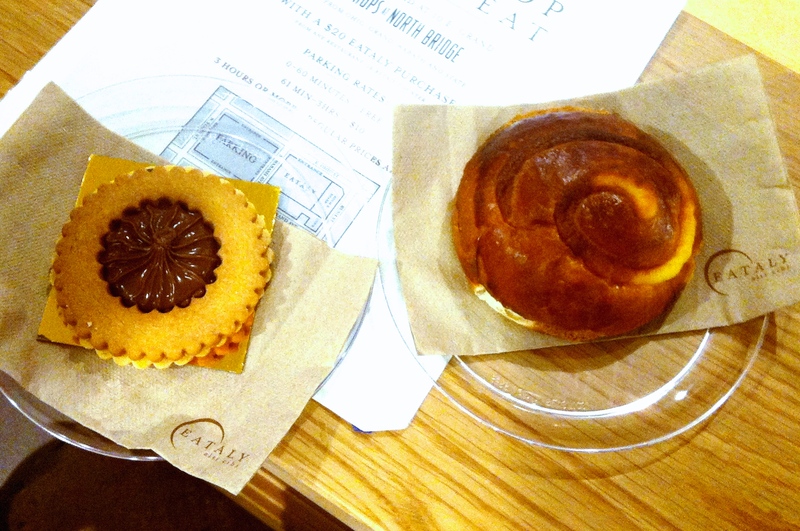 All I have to say is dang, they are doing something right up in Eataly. The pasta tasted so fresh! I have never had noodles that tasted quite like that. With every bite, Becca and I had another compliment. 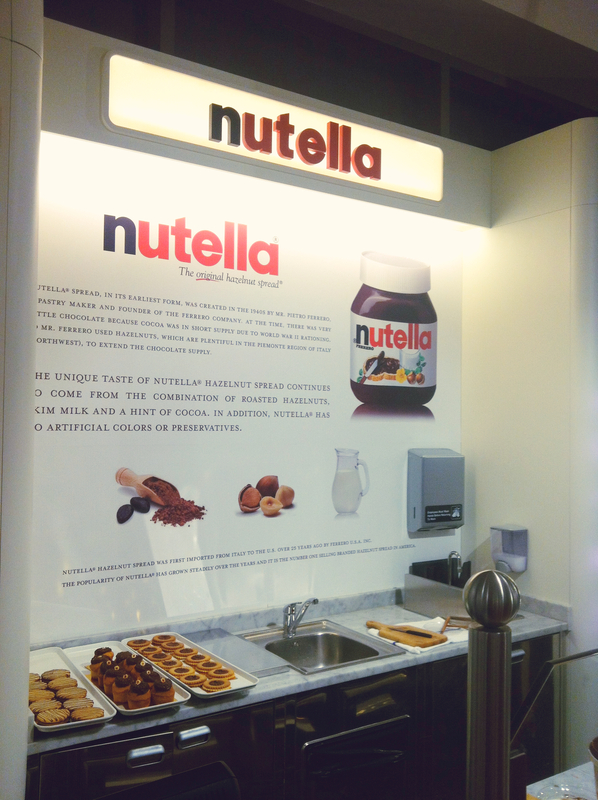 Once we finished, we were stuffed, but still felt obligated to pay a visit to the Nutella bar. I mean, it was right there by the exit and full of yummy options with the sweet spread, how could we not?? We opted to share a cookie with Nutella on top and a soft croissant with some spread in the middle. Completely worth the last bit of space in our stomachs. Becca and I walked out smiling ear to ear, feeling as though we just walked out of an Italian dream. If I had an endless amount of money and nutrition facts were a thing of the imagination, I would probably be there every night. Got any restaurant experiences that sound like this fairytale? I want to hear! 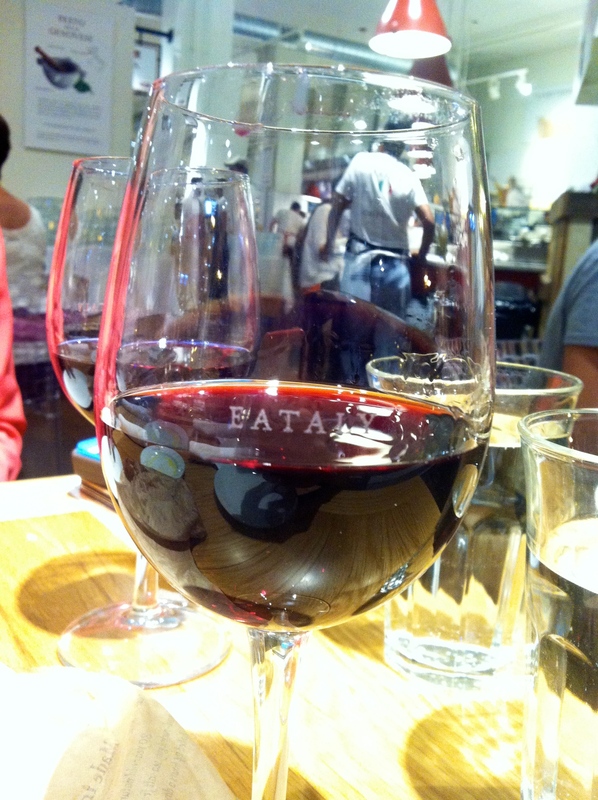 Eataly makes me so very happy… love this post!! Ah yes, Eataly is so good for the soul! Thanks for stopping by Lisa!